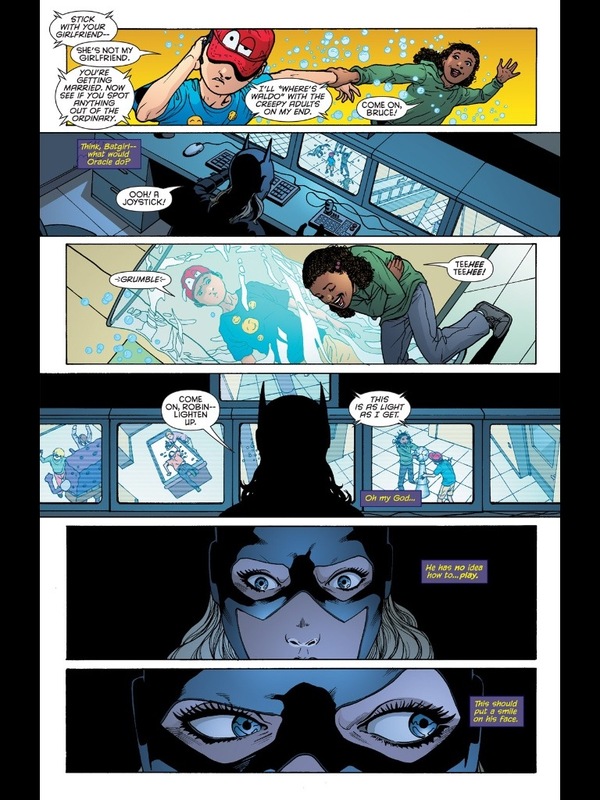 This issue of Batgirl is self contained so you don’t need to have read any of the past issues. 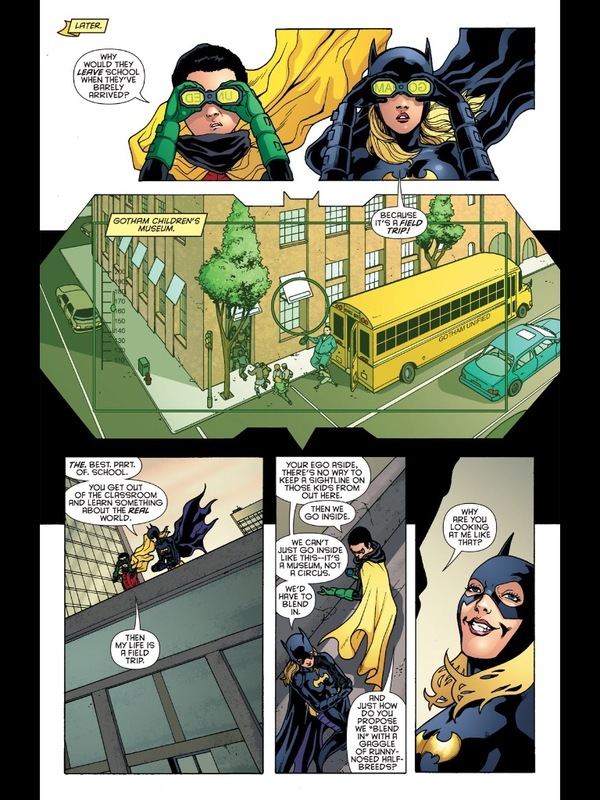 This time Batgirl is given her first mission by Batman to look into children of the middle class being abducted and held for ransom, Stephanie over sleeps, but when she gets there she comes across Robin who put himself on the mission and together Batgirl and Robin must work together to solve the case. This issue the plot is light and everything is wrapped up a little too easy, but this was all about the dynamics between Batgirl and Robin. 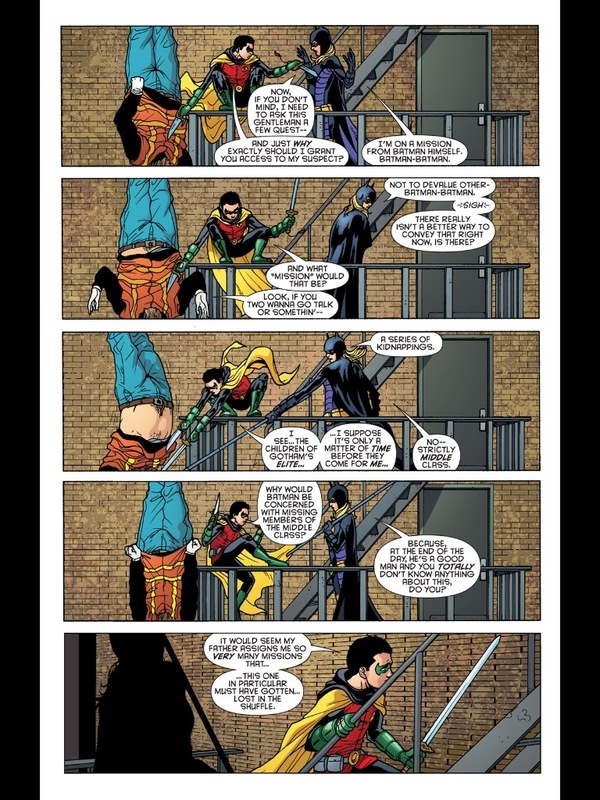 The best parts of the Batgirl series are the interactions between the 2, which is a dislike due to the arrogance from Robin, but their is also a mutual respect and one can see Stephanie Brown and Damien Wayne as a brother/sister relationship just a bit dysfunctional as Damien is well a little nutty best way to put it. 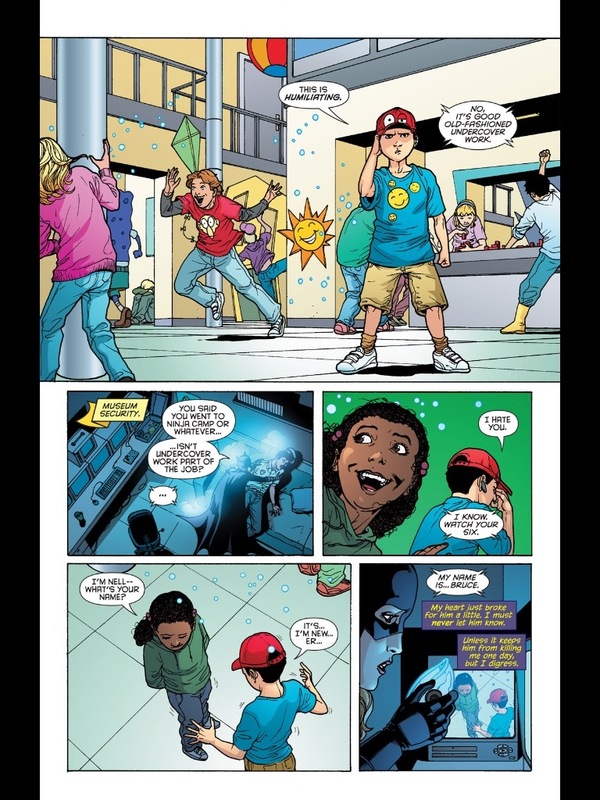 This issue has some really great writing as the scenes with Batgirl and Robin are hysterical and when Robin has to go undercover its really funny, but tragic as well since though he’s 10-years old he cannot relate to kids his own age and he doesn’t know how to just be a kid and even Batgirl feels bad for him due to how awkward he is. But it’s still also really funny with a deeper level and the finale was epic as Stephanie takes Damien out so he can just be a kid and even though he doesn’t show it he enjoys himself. He mentions wanting to stab Stephanie, which is just Damien being Damien as he can’t relate to people and doesn’t have social skills. Though that might sound demented, which I suppose it is, but even Steph knew it was just an act on Damien not wanting to let his guard down. 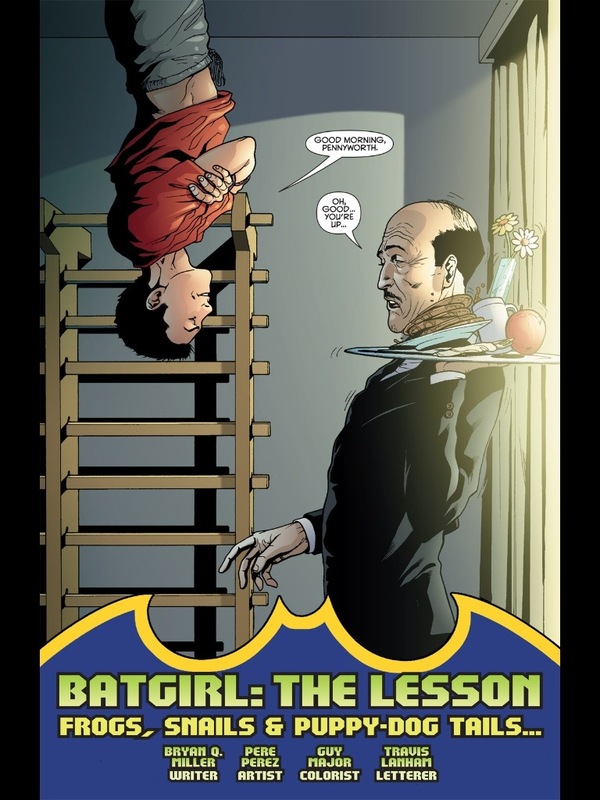 In my opinion this issue was hands down the best of the Batgirl series and makes for such fun to read and reading it over its just as good each time out. If you never read any of the Batgirl comics no worries since this is self contained and you don’t need to read the issues with Robin since the writer does a great job that you can just pick this up and still get the dynamics of their relationship. 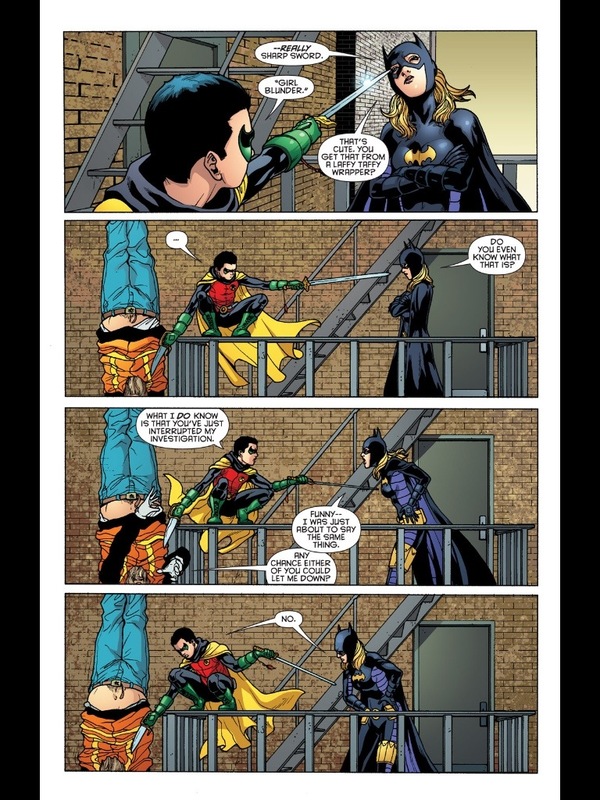 I’ll admit even though I loved the past issues with Batgirl and Robin I wasn’t very fond of Robin, but this issue really added a lot of depth to him and he’s starting to grow on me. It’s a shame this series was cancelled to return to the Barbara Gordon Batgirl as I would love to have seen more issues with Robin and Batgirl (steph) but regardless I highly, highly recommend this issue (and series for that matter) while yes the plot is weak, but the brilliant interactions between Batgirl and Robin makes this a great, great and fun read. Overall this was just a great issue to a really awesome series. 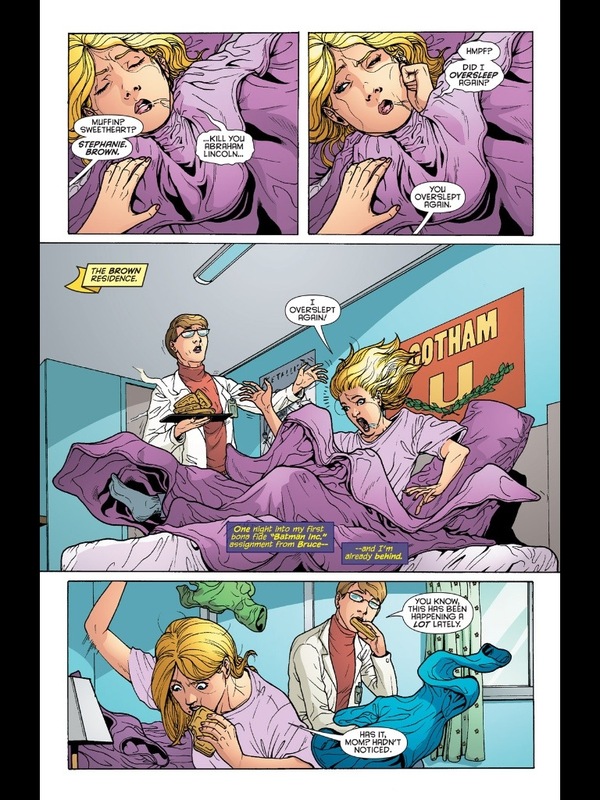 I love Stephanie Brown as Batgirl she’s just a fun character in a really fun series. Stephanie has now taken the mantle of my all-time favorite superhero and this issue in my opinion is the highlight of the series. Like I said this was just so funny and entertaining. So what are you waiting for??? Go,read this now!! 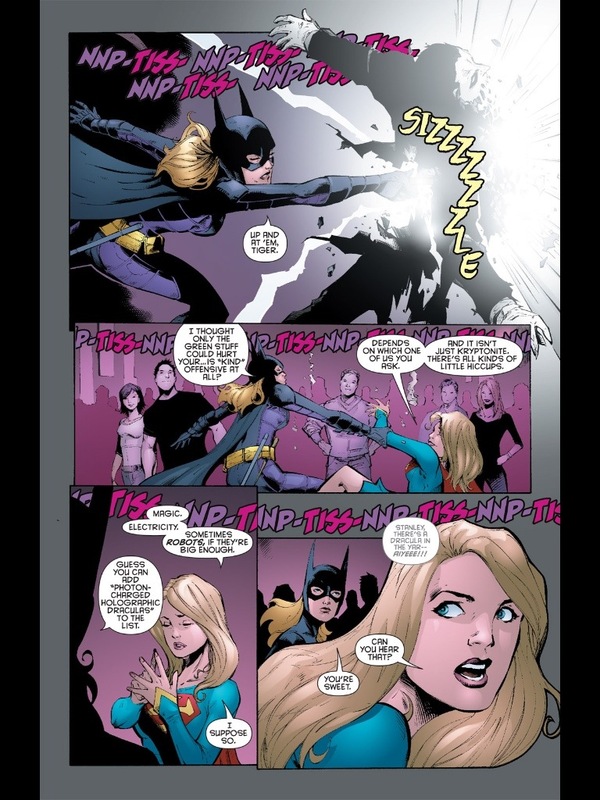 While most people spend their time reading Batman and Superman I’m reading Batgirl and Supergirl. 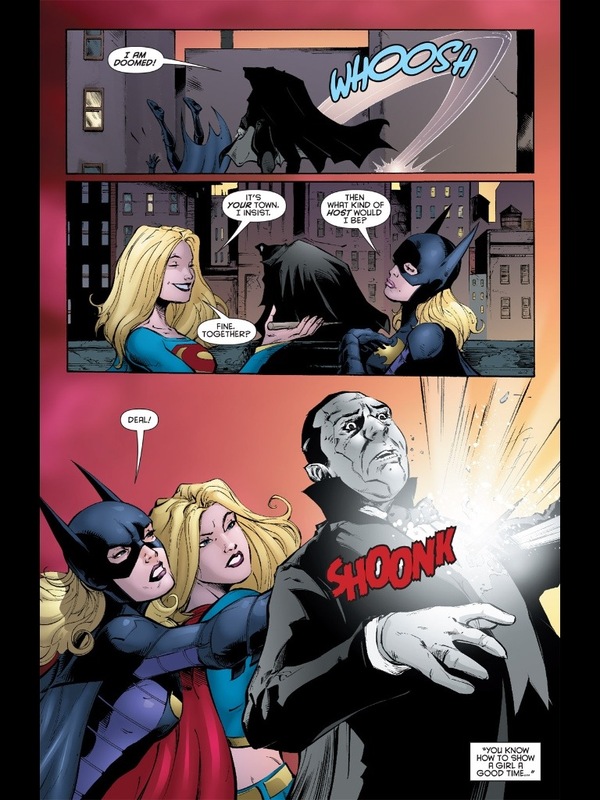 What can I say I have a thing for strong action driven female characters and so therefore Batgirl and Supergirl very much appeal to me due to that. 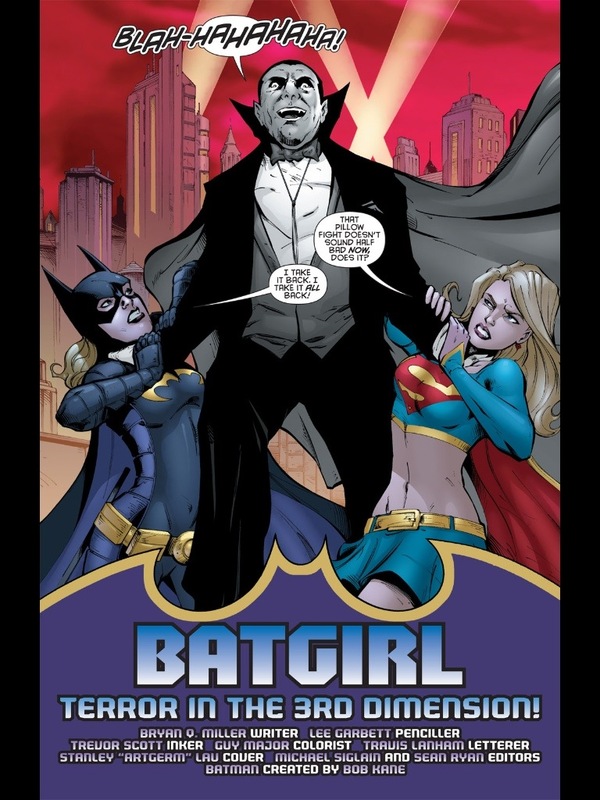 This issue of Batgirl features Supergirl with a horror twist, which really appealed to me as a horror fan. 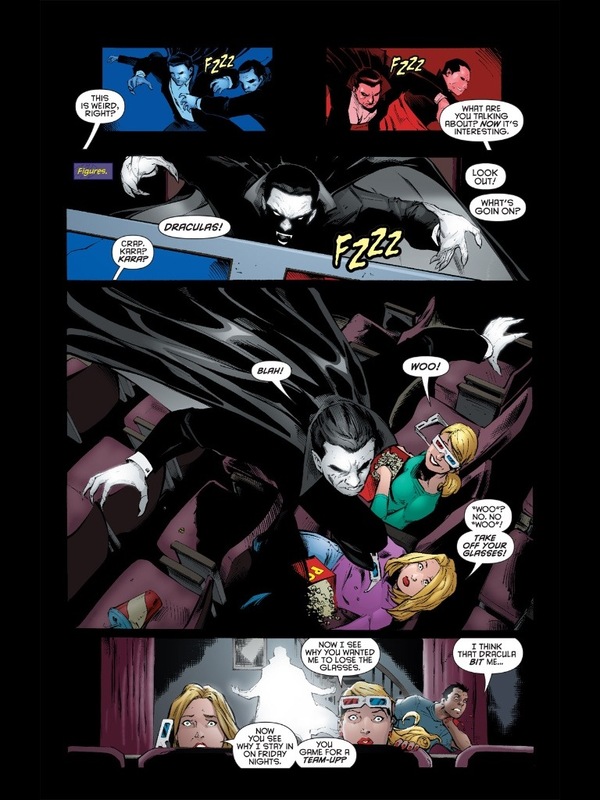 Stephanie Brown (Batgirl) is spending her friday night playing games with her mother when Kara (Supergirl) shows up, desperate to be with someone her own age Steph and Kara head out for the night and end up going to see a Dracula movie playing in 3D, but Dracula (well a bunch of them actually) escape from the big screen and go on a rampage, but no need to worry as Bargirl and Supergirl got this covered. This is a self contained issue so you could just pick right up and read it regardless if you’ve read the previous issues or not. 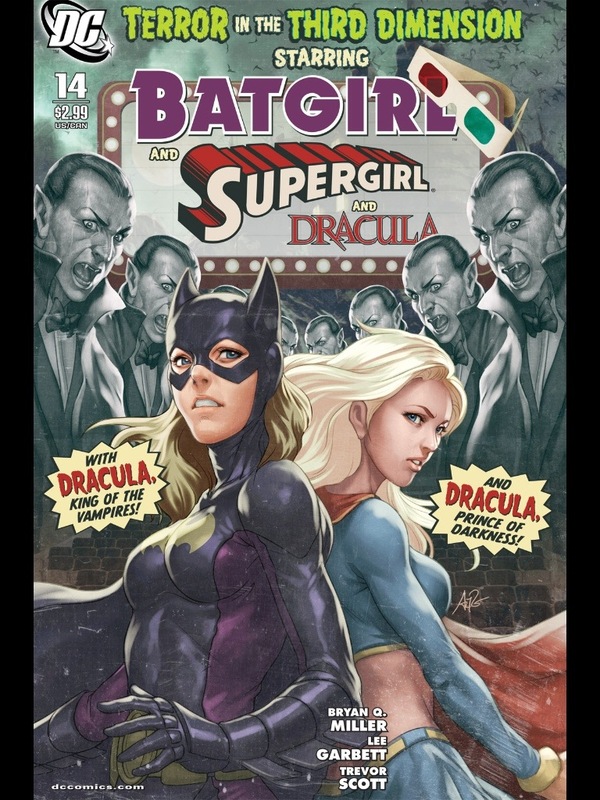 This issue was a total blast with a fun and campy tone as Batgirl and Supergirl take down Dracula. Things are played up to camp value and this to me sort of has a retro feel. Like I said everything here is played light and fun and Stephanie and Kara work really well together both under their superhero personas and as regular folk. 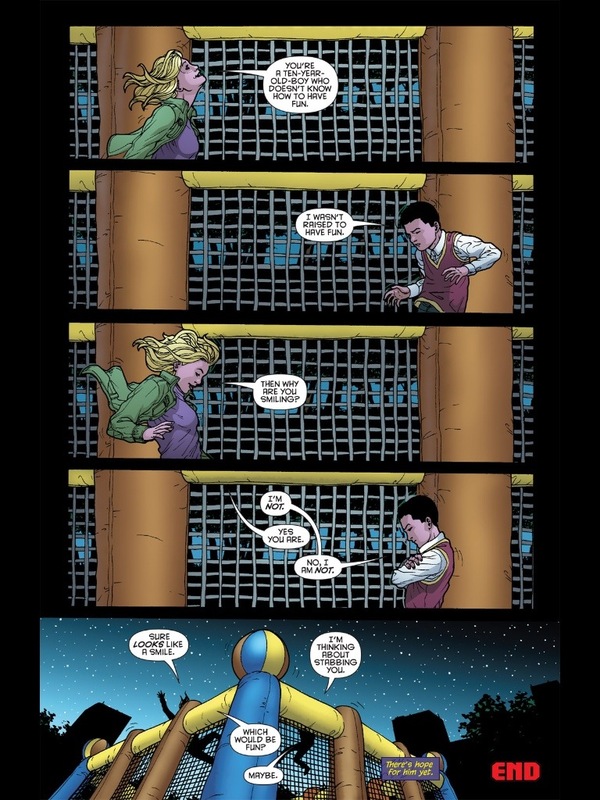 I just love the interaction between the 2 characters and this issue gave me a big smile while reading it. The only downside is the story does move a little too fast and honestly I guess the best way to describe it is it feels like a page or 2 are missing, but don’t let that last comment prevent you from reading this since it was a lot of fun. 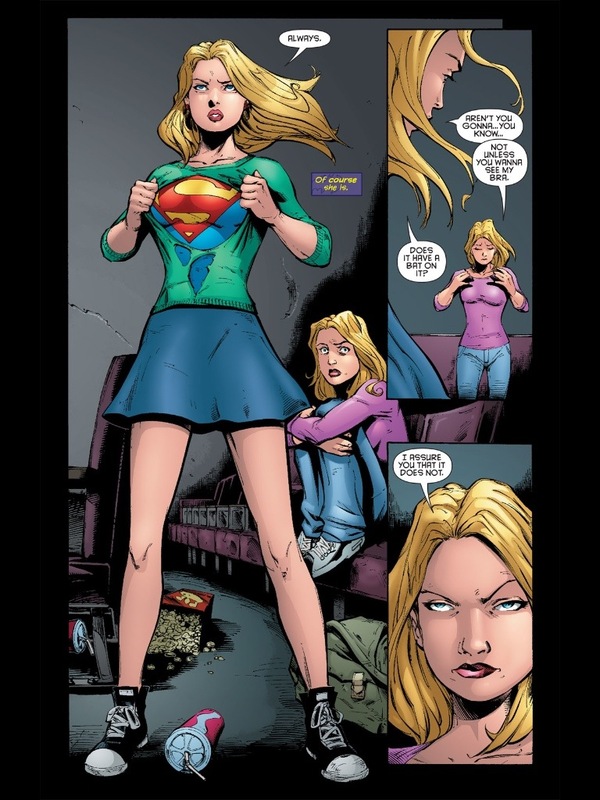 The camp factor works well and I really enjoyed the interactions between Steph and Kara and also enjoyed it when they were Batgirl and Supergirl. This was just a really fun issue. 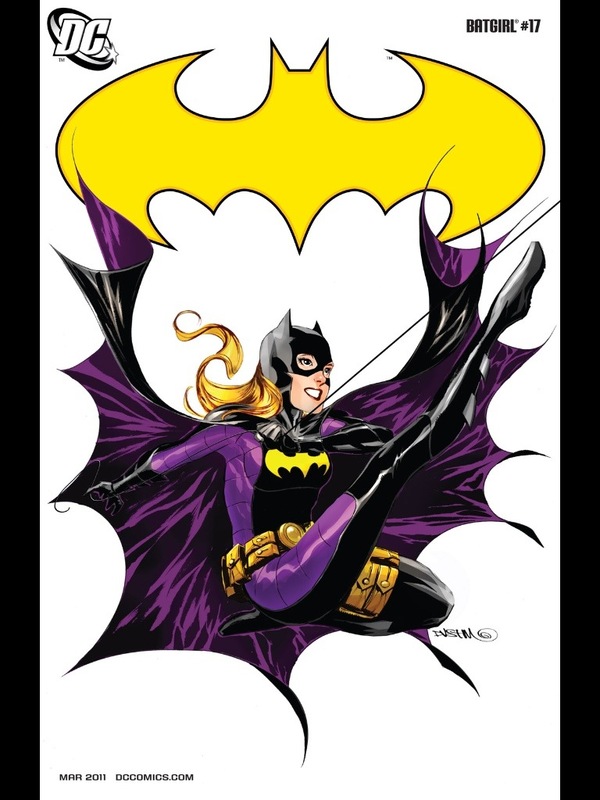 While it does move a little fast this is one of my favorites of the Batgirl series and this comes highly recommend if you just want some fun. 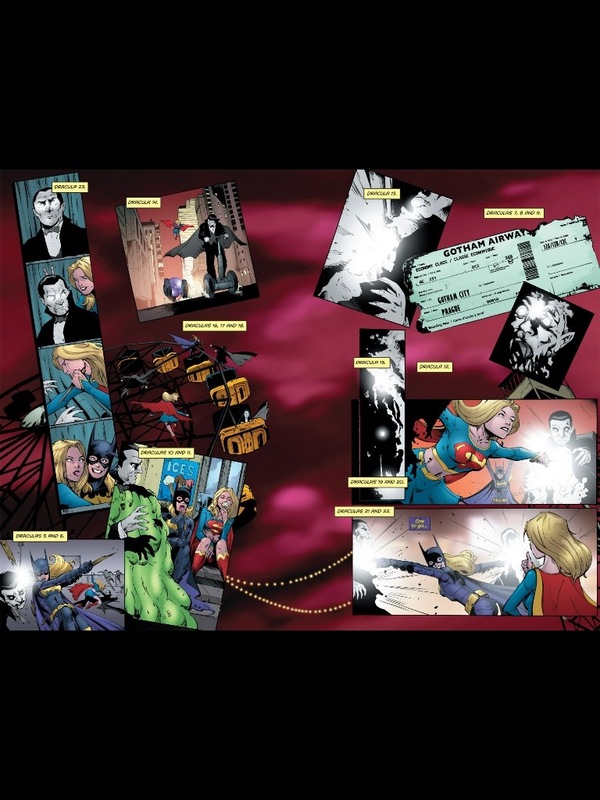 Who needs Batman and Superman when I can read Batgirl and Supergirl!